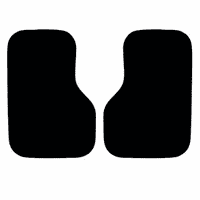 Style: Please Choose One(5007) Front Wheel Drive-Front Mats Only(5010) Front Wheel Drive- Front & Rear Mats (+$20.00) Total= $125.00(5008) Rear Wheel Drive Front Mats Only(5011) Rear Wheel Drive-Front& Rear Mats (+$21.50) Total=$125.00(5041) Truck/SUV Cargo Mat 36x36(5040) Truck/SUV Cargo Mat 34x48 (+$21.50)Total= $125.00 Carpet Color: Please Choose One110-Red115-Royal Blue120-Beige Berber130-Grey Berber140-Oyster Berber158-Black159-Brick Red168-Navy169-Burgundy184-Beige186-Dark Grey190-Hunter Green200=Light Grey225-Teal250-Purple Binding Color: Please Choose One110-Red115-Royal Blue120-Beige Berber130-Grey Berber140-Oyster Berber158-Black159-Brick Red168-Navy169-Burgundy184-Beige186-Dark Grey190-Hunter Green200=Light Grey225-Teal250-Purple Font: Please Choose OneScriptBlockCenturyBrushChancerySeagull Embroidery Color: Please Choose OneWhiteCreamBeigeTanNeon YellowYellowGoldOrangeBright RedBrick RedBurgundyHot PinkPinkPurpleRoyal BlueNavyTealKelly GreenHunter GreenPalaminoDark BrownBlackDark GreyLight Grey Monogram: Initials: Name: Second Line: NoYes (+$16.00) Second Line: Who is this item for? A great gift for the hard to buy for person! 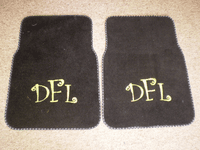 These personalized car mats are fun way to put your own personality into your car. 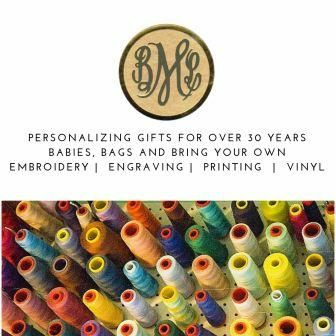 Monogram (Middle Letter 5" or 3 straight 5" letters) or 1 line of embroidery (name/text) at 2 1/2"-3" height up to 12 charachters and spaces is included. A second line is an additional $16.00. If you would like different monograms or names on drivers/passenger side it is an additional charge. Please call for pricing details. Also oversized lettering will be an additional charge, please call for pricing.